Michigan is known for its Great Lakes that surround it and Roscommon County, located in the Center of the State, is known for the “Other Great Lakes.” We will travel all around this area discovering Houghton Lake, Lake St. Helen and the lake they call one of the most beautiful in the world, Higgins Lake. We have collected information and web links related to the area and combined them here with photos we took and video clips from the show in what we hope will be a helpful guide as you plan your trip. For assistance or for more information, call the Houghton Lake Tourism Bureau @ (800) 676-5330 Have fun! Sullivan Beach Site is over an acre in size with a sandy beach for swimming. Public restrooms are on site, along with a small playground. A launch site on the east side of the park is suitable for launching small boats only. The Historical Village contains 13 restored 1800s Buildings and a 1920s era Playhouse. These buildings include a schoolroom, museum, town hall, dress shop, general store, doctor’s office/ pharmacy, barber shop, a homestead, a chapel and others. Every year on the first weekend of August, Village Day Festival is held in the historical village. During Village Days the historic site comes alive with demonstrations, guides in period costumes, all buildings open and operating. There are also numerous craft and musical demonstrations. A weekend gathering of ATV enthusiasts providing enjoyment of the outdoors, the company of family and fellow ATV enthusiasts, and unique, fun activities. The main events of the Jamboree are the Mud Bog, Sand Run, and ORV Pull. Other Attractions include: ORV Training, Silent Auction, Obstacle Course, Vendor Displays, Scenic Rides and more. Each year it gets bigger and better. Fun for the entire family !! The Firemen's Memorial is a monument dedicated to all fire fighters that have died in the line of duty. This memorial is one of few in the nation to honor these fallen heroes. Each year usually during the 3rd week of September, the Michigan Firemen's Memorial Festival is held in remembrance these brave citizens at the Roscommon County Fire Training Grounds. During this festival there is a parade, antique equipment demonstration, a memorial service, a light parade, music, dancing, emergency crew competitions and many more planned activities. Marguerite Gahagan Nature Preserve - Peaceful hiking trails amongst mature white and red pine forest and cedar swamp. This is an area working to protect habitat and wildlife forever. The Preserve is open to the public from dawn until dusk. One trail is paved and wheelchair accessible. Gahagan Preserve is located in Roscommon, off M18 and Southline Rd. directly behind Compost Center. The South Branch of the AuSable River is world renowned for canoeing, kayaking and tubing. The South Branch of the AuSable River flows northward out of St. Helen to Roscommon (This section is floatable only at certain times of the year). Out of Roscommon the AuSable River flows north and east through the George Mason Wilderness Retreat. There are no homes or roads in the 3,500 acres between Chase Bridge and Smith Bridge; this stretch of the river is preserved as a wilderness. Here the river's depth ranges from one to four feet; a few places are deeper. A moderate current will take you steadily downstream. The Roscommon Canoe Liveries can help you plan trips from 1-4 hours to overnight trips. The Civilian Conservation Corps Museum has many photographs and artifacts depicting the CCC workers day-to-day life and accomplishments, including a replica CCC barracks building with exhibits. This group between 1933 and 1942 planted 484 million trees, constructed 7000 miles of truck trails, 504 bridges and 222 buildings. Wellington Farm, USA is a 60-acre open-air interpretive museum designed to provide an educational opportunity for visitors to experience life as it was in rural mid-America during The Great Depression. 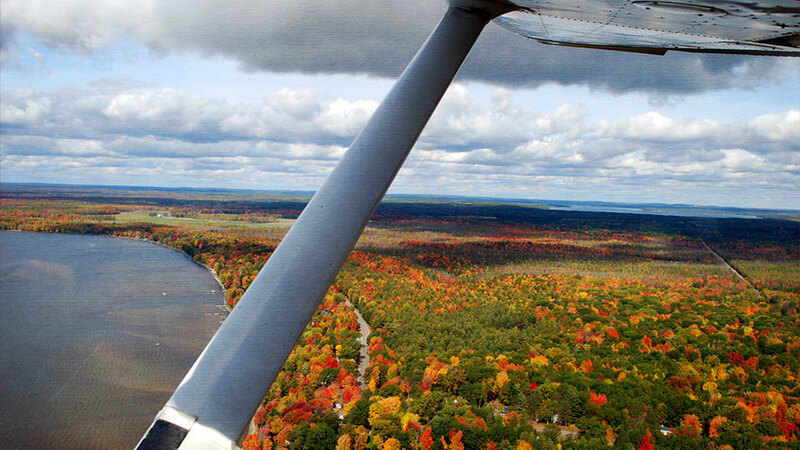 Through a series of displays, a wide variety of exhibits, and beautiful natural settings, the park provides a variety of educational, recreational, and cultural opportunities for visitors to Northern Michigan. Great Lakes Windsurfing LLC is your source for all windsurfing needs. 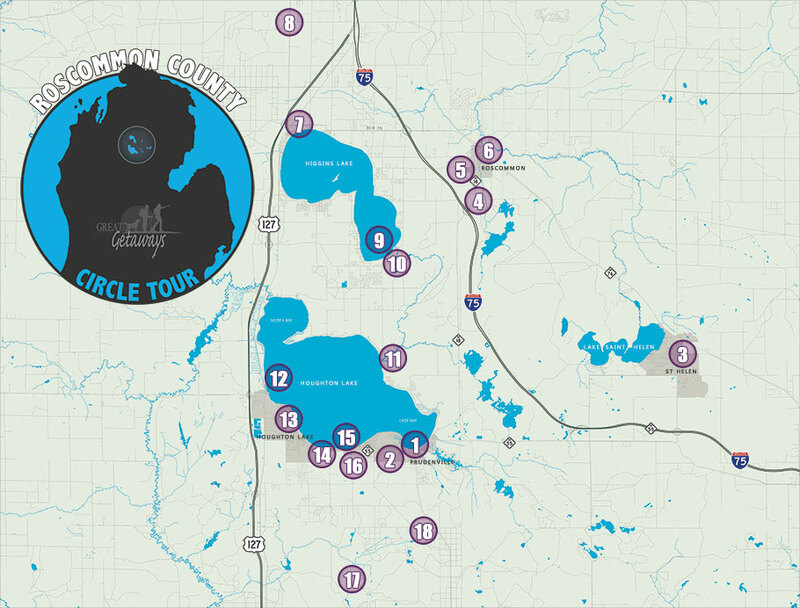 They host the Great Lakes Demo Tour to provide introductory lessons, rigging and tuning clinics and an opportunity for riders of all levels to try the latest gear in locations where they live and sail. To the south lies Marl Lake, more wildness, and better wildlife viewing. The Marl Lake portion of the park is about 700 acres and includes Marl Lake and a small boat launch with vault toilets. This area is also the parking area and trail head for the five mile hiking trail along and around the west and south shores of Marl Lake. The Marl Lake upland is forested with oak, maple, and pine predominating with some white birch, ash, and other species mixed in. A county-owned public-use airport located five miles northeast of the central business district of Houghton Lake. Lakeland Recreation is the number one place in Houghton Lake to go for fun, whether you are celebrating a birthday, going on a date, or looking for a place where you can take the entire family. We have lots to do, including 2 go-kart tracks, 2-18 hole miniature golf courses, an arcade, bumper cars, bumper boats, baseball and softball batting cages with many pitching speeds, a haunted mansion, kiddie rides and the extremely fun air powered bazooka ball guns. The Pines Theatre is a 450-seat Log Cabin Chalet was designed by C. Howard Crane to look like a hunter's cabin. Originally opened in 1941 by W.J. Olson, who owned many theaters in Michigan at the time, the Pines features 40-foot cathedral log ceilings, a parquet wood floor, and a large collection of trophy game animals. This unique tourist/gift shop has many designs on T-shirts and Sweatshirts, moccasins, jewelry, and fudge. They also sell candles, toys, Michigan books and much more. Located inside Arnie's Arts and Crafts at Houghton Lake, Arnie's Coffee shop offers specialty coffees, Chai tea, smoothies, and more. Free WiFi, Big Screen TV and a cozy "Up North" atmosphere. Hours: Mon.-Sat: 7AM to 5:30PM. Sun. 8AM to 4PM. Unique Gift Shop is located in the West end of our building at Houghton Lake. Browse our selection of: Home Decor', Accent Furniture, Garden Furniture, Garden Stakes, Statues, Pots, Urns, Silk Floral & Greenery, Yankee Candles, Northern Lights European Candles, Lamps, Clocks, Frames, Mirrors, Artwork, Hand-Painted Glassware, Wine Gifts & Decor' and more! This 3 mile loop trail winds through an old growth pine forest. Designed for hiking and cross-country skiing this trail has several bridges, including a covered bridge. The trail contains scenic overviews of pristine wetlands areas. Let’s get muddy. Let’s rev up our engines and venture out on hundreds of miles of the best ORV trails in the State of Michigan. Here two-track, twisty single-track, and soggy mud bogs welcome dirt bikes, quads and four-wheelers.